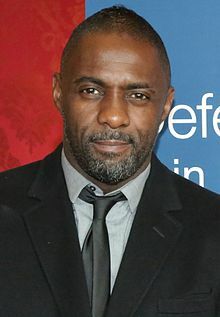 Idrissa Akuna "Idris" Elba, OBE (born 6 September 1972) is an Inglis actor, muisicker, vyce actor an DJ. ↑ Yuan, Jada (8 June 2012). "Idris Elba on Prometheus, Learning to Box, and His Party House". vulture.com. Retrieved 14 October 2013. ↑ Lisa Respers France, "Idris Elba 'too street' to play James Bond, writer says", CNN, 2 September 2015. This page wis last eeditit on 8 September 2018, at 19:41.